Shred the zucchini, scallion, & red cabbage, and then dice into smaller pieces. Spray Nature’s Promise Olive Oil Spray on the frying pan and heat on medium setting. 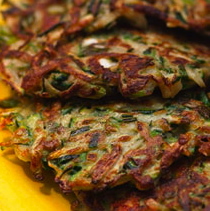 It’s the Zucchini Harvest season again, so I decided to create an upgraded, low-carb version of my Zucchini Pancake recipe on pages 76 & 77 in my best selling book, Remedy Recipes! This one has some simple but flavorful additions, plus some great nutrients from the shredded red cabbage. You can make a larger batch for more plates, or for a couple of your daily meals. They’re very tasty when they’re fresh from the pan, & they still taste delicious in the microwave too. It took me a few attempts to perfect, so don’t be ashamed of their looks. LOL. They’re not that pretty on the first try, but they’ll improve! Hope you enjoy this great way to cook up some fresh garden zucchini!